Cut across the top-crust side of the bread and cut a pocket in each slice. In a small mixing bowl stir together the softened cream cheese and the orange marmalade. Mixture should not be soupy. Spoon about 1 tablespoon of the cheese mixture into each pocket or just fill the pocket. In a mixing bowl beat eggs, milk, vanilla, cinnamon and nutmeg until combined. Dip stuffed bread slices into egg mixture. Heat butter or margarine on a griddle and add stuffed bread slices. Fry over medium heat until golden brown, turning once. Serve with warm orange syrup and garnish with orange slice and powdered sugar. 1 6-ounce can frozen orange juice concentrate. Place over low heat until butter is melted. Do not boil. Remove from heat and cool for 5-10 minutes. Beat until slightly thickened and serve warm. 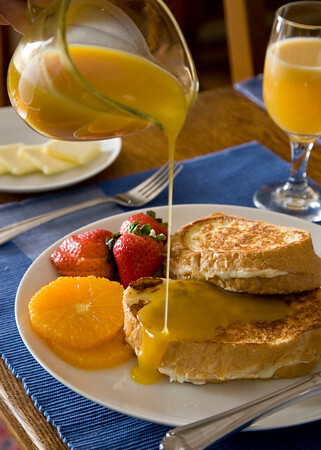 Orange Syrup can be made ahead and will keep in the refrigerator for several weeks. This entry was posted in French Toast Pancakes and Waffles, Sauces Toppings and Salad Dressings, Sweet Breakfast Entrees by admin. Bookmark the permalink.